Walden Media continues its astounding track record of bringing kids’ fantasy books to life with City of Ember, based on the book by Jeanne Duprau. I can only assume two things: firstly, that the book is less well known than ‘The Chronicles of Narnia’ or ‘Bridge to Terabithia’ because I’ve never heard of it, and secondly: that ‘The City of Ember’ is much better than the film, because I’ve seen quite a few online fans complaining about the adaptation. Ember lies deep beneath the surface of the Earth, and for its inhabitants, there is nothing ‘up there’, just darkness. Young Doon Harrow (Harry Treadaway) and Lina Mayfleet (Saoirse Ronan) have just come of age and been assigned their official duties in the city. Both wonder what lies beyond, but it’s Lina that finds a mysterious box alluding to a way out of Ember. Unfortunately, a prologue tells us a great deal about the history of Ember and the mystery of the box, so the first half of the film we’re simply waiting for the leads to work it out, which is always frustrating. Once things finally get moving, the film is surprisingly lacking in excitement. It’s a pity, because this is a beautiful film. The enormous set makes it feel old fashioned in a good way – we’re not being inundated by greenscreened backgrounds. The costumes and production design are pretty also, leaning ever so slightly towards steampunk. The presence of Tim Robbins and Bill Murray also hints that this could have been something more – both actors have been extremely choosy lately. I can only imagine that the screenplay got washed down over time, because it’s full of narrative dead ends and characters whose motivations are either merely vague or missing altogether. It’s not entirely clear why the search for the truth is actually a ‘race against time’, either. 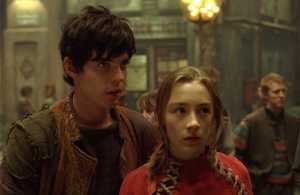 City of Ember probably lacks enough excitement for kids, and is certainly too shallow for adult viewers. The concepts are sound, featuring corrupt politicians, alternative theology and the sins of the fathers (á la The Village), but none are developed. In terms of Walden Media’s quality of output, this is more like The Seeker: The Dark Is Rising than Bridge to Terabithia. This entry was posted in Film Reviews and tagged Childrens, Science Fiction, Steampunk by Stuart Wilson. Bookmark the permalink.